Sometime in April 2008 (sorry for being lazy with postings), I was suppose to submit Socketron for a show entitled; Art Multiple Exhibition at Ke Center, Shanghai. Unfortunately, something went wrong with my DHL courier and the work was stuck with the Chinese Customs until a few weeks after the exhibition ended. My first attempt to submit a work for China, and this was what happened. I'll be extra careful the next time. 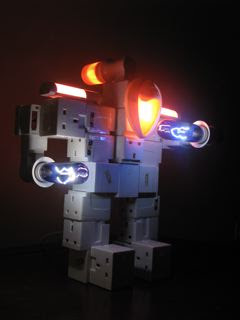 For Socketron, I've added electric mosquitoe repellents and UV light bulbs to my usual array of sockets and night lights. I think I've also found a perfect subsitute for the head - a battery charger. Next time. Hopefully that will change the design more drastically. hey! i saw this in the blackburn museum...me and my little brother (6)loved it, seeing this he said 'i can make this' and that why i loved it because of its simplicity! and yes u can make art too. why not? All copyright reserved © 2011 Vincent Leong. Simple theme. Powered by Blogger.